In the USA, over 40 percents of people use iPhone, and thousands of them are struggling in data loss every day due to reasons like iOS update fail, device broken or factory reset. 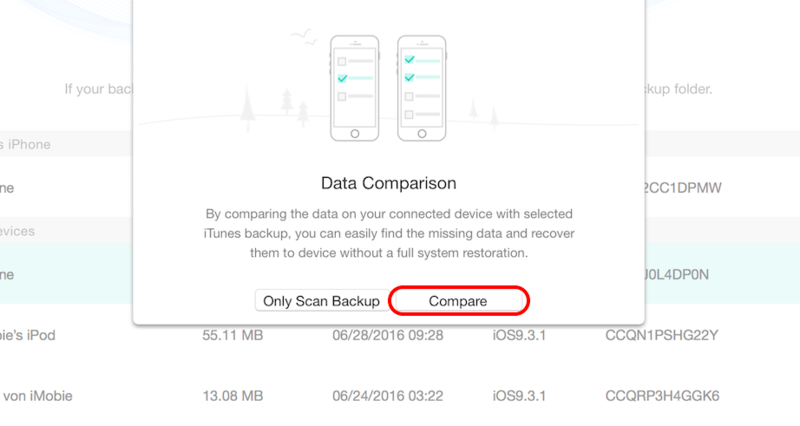 For retrieving lost data, some iOS users like to use professional apps. But, which data recovery software is worth trying and can be the best one for the iPhone? How to get the “Best” iPhone recovery app? I’ve tested all iPhone recovery programs I could access to recover deleted data on my iPhone, and finally picked out these top apps according to my best iPhone data recovery criteria. Wondershare’s Dr.Fone gives you a full toolkit to fix the problems on your mobile. 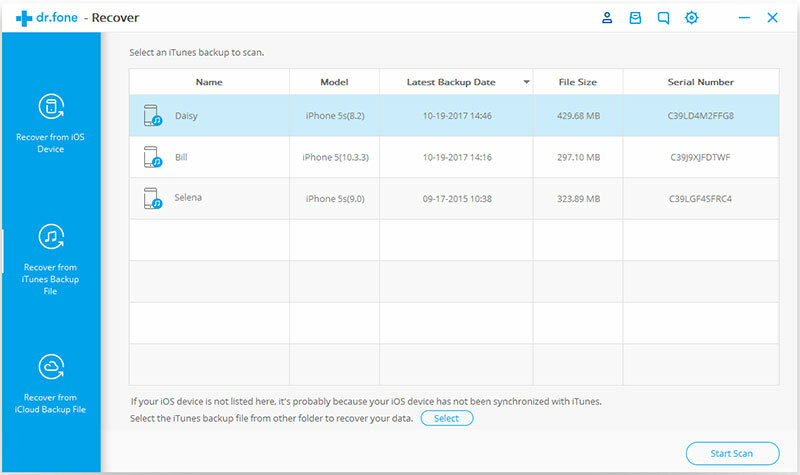 And its Dr.Fone -Recover (iOS) is specially developed for finding deleted data from your iOS devices and retrieving data from your iOS backups. If you’ve accidentally deleted something on your iPhone, Dr.Fone would be very helpful to get them back. This app works on the computer. And I’ve installed Dr.Fone on my Windows computer, and tested it for retrieving my deleted messages on my iPhone 7, and it worked well to get back some of my lost messages that Abbie sent me. And it also gets back some images I’ve attached to the conversation. The recovery feature – Restore from iTunes backup file is really good for people who have ever synced or backed up their device to iTunes. 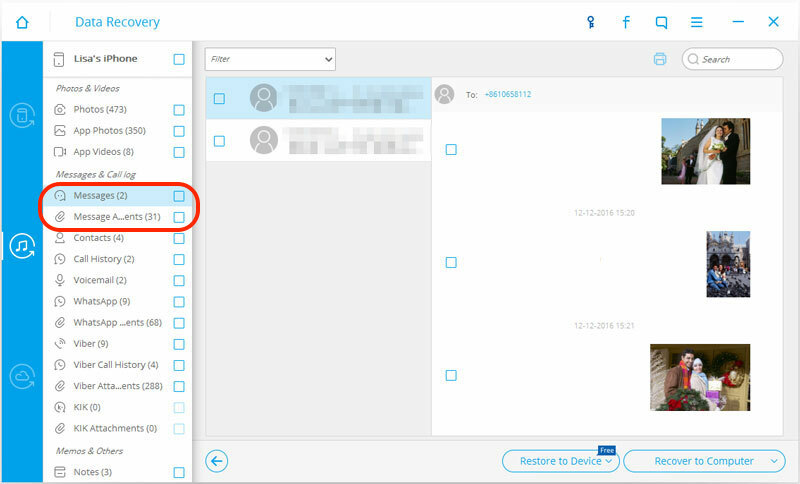 This feature allows me to preview and extract the pictures, call history, old messages, and other things hidden in the backup files on my computer. This software provides with a free trial for users to scan and preview deleted data. But if you want to recover the lost data to your device or print the data as some document files, you have to buy its full version license to remove the free trial limitations. This app is known for its Compare function which can automatically pick out those files that stored in your iPhone backup file but disappeared from your mobile device. This is good for quickly finding your lost iPhone data from backups. 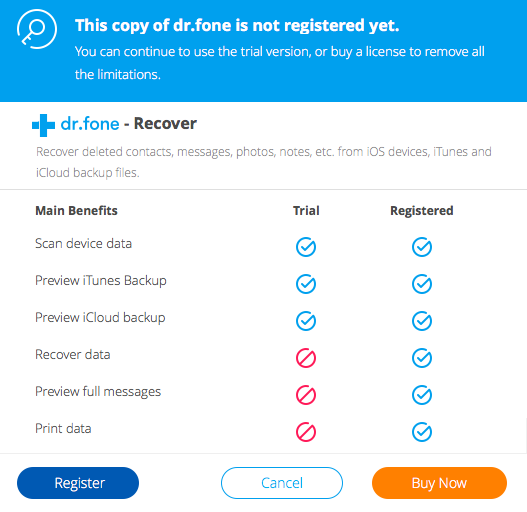 Similar to Dr.Fone, PhoneRescue also released one free trial version through which you can scan the deleted data and know whether there is something recoverable. However, if you want to preview all deleted items or recover them to your iOS device, you have to pay at least $49.99 to activate the recover function. Supported Platforms: Windows 10, 8, 7, Vista, XP, both 32bit and 64bit; macOS Mojave, macOS High Sierra, macOS Sierra, OS X 10.11, 10.10, 10.9, 10.8. FonePaw provides mobile users with many useful solutions including the data recovery service we are talking about. 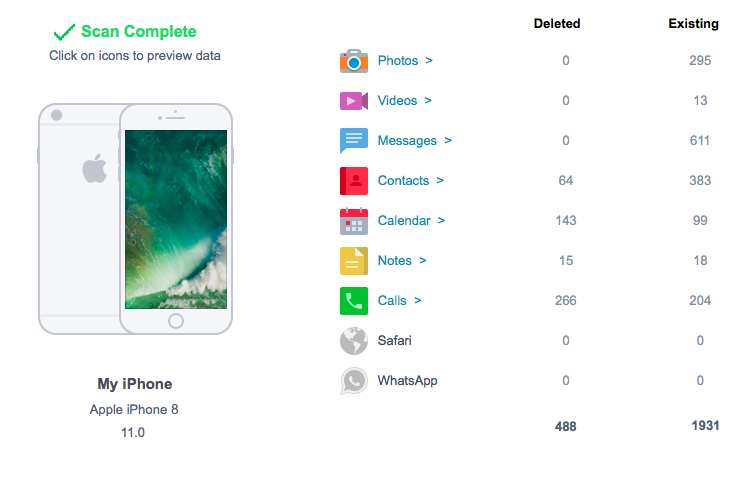 Its iPhone data recovery app performs a good job in retrieving data for people are regretting deleting files on iPhone and iPad. 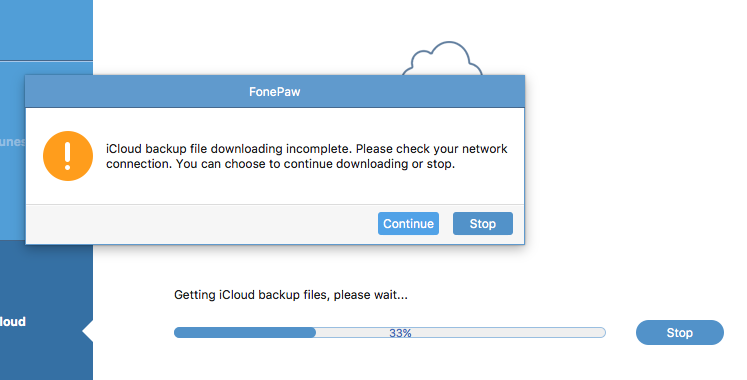 Just like PhoneRescue and Dr.Fone, FonePaw also gives three modes to get back deleted files from iPhone: Recover from iOS Device, Recover from iTunes Backup and Recover from iCloud. You can choose any mode according to your situation. 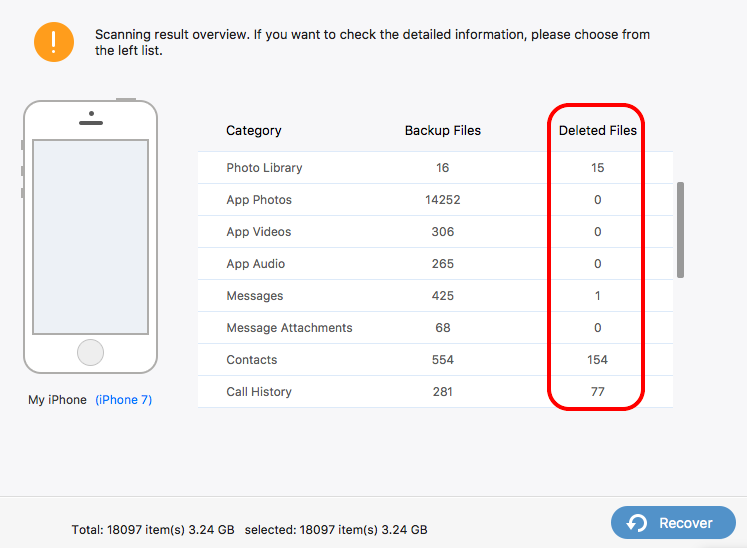 For instance, if your iPhone was stolen or lost, you can try to recover from iTunes backup or from iCloud. Based on my tests, this software is good for recovering data from iTunes and is capable of finding deleted items directly from the iPhone via its Recover from iOS Device mode. But it’s not perfect because FonePaw can’t access my iCloud backup. Besides, it isn’t free software, also. And its trial version has limitations. And you should notice that this app can’t get the deleted data back to the iPhone, but only save the deleted items as files like PDF. Supported Platforms: Windows 10, 8, 7, Vista, XP, both 32bit and 64bit; Mac OS X 10.7 – 10.14. Enigma Recovery would be another professional data recovery tool for iOS users. Just like PhoneRescue, it offers 3 modes to assist you to retrieve lost files on iPhone and iPad. Besides, it’s the only app that offers support via telephone calls in UK/USA areas. Based on my test, Enigma did well on extracting my lost files from iPhone backup, and 100% safe without the virus. 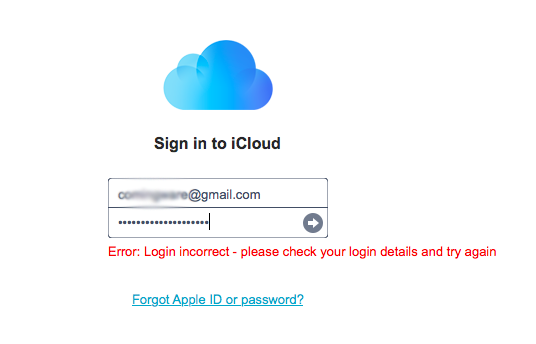 However, it failed to access my iCloud backup, and couldn’t connect my iOS 12 device. You can read my full review of Enigma Recovery in this 2018 to get the detailed info. This software is not free and charges from 59.99 dollars. FoneLab is designed by Aiseesoft Studio, one famous software developer dedicated to producing mobile, multimedia and PDF Tools. I’ve downloaded it to my Windows 10 computer and used its data recovery function to retrieve my deleted texts. As I found, FoneLab is quite similar to FonePaw on the interface and the features. These two apps may be the same app but with different interface and price. FoneLab’s price started from $79.95, and FonePaw from $89.95. 6. Other iPhone data recovery apps I’ve used. Besides the above apps, I’ve also tested other iPhone recovery apps, which have similar features to those I listed above. And almost all these apps can recover a few pieces of information and files on my iPhone device. What makes the best iPhone data recovery（My Personal Opinion ）? The best iPhone data recovery in my eyes is the one with an easy and quick recovery speed, a good compatibility and data recovery capability, and NO Virus. Of course, the price should be reasonable if the app is not free, at least, not expensive than individual data recovery service from local iOS experts. For me, the primary considerations in choosing one iPhone data recovery app are the iPhone compatibility and data recovery capability. The best iPhone recovery app is ought to be compatible with a wide range of iPhone models, and be able to recover a variety of data types/formats, like messages, photos, and contacts. Secondly, I would like a simple recovery process. The design of the recovery app should be clean and easy to understand so that the app can quickly navigate users to where the users want to go. That means the best iPhone data recovery program should have an easy and quick recovery process. Finally, as one software, I care about whether it’s safe since some virus may be hidden in the app installers. So before using any iPhone data recovery software I would like to scan them from virus using security software. How do these apps work to recover data on an iPhone? 1. These apps offer you two methods to recover data. In general, almost all of these iPhone data recovery software support recovering your lost data in two methods, retrieving data from iPhone directly without backup and extracting data from iPhone backup you made using iTunes or iCloud. 2. These apps work on the computer. All of these apps are working on Windows PC or Mac because as one professional iPhone data recovery tool, they should be able to extract files and info from iTunes backup for retrieving when the iPhone was lost, damaged, stolen or crashed. 3, They are commercial software with a free trial version. Some of these apps are called “Free”, but it’s not real. They are actually commercial software developed by independent software vendors. And these vendors offer some free trials with many limitations. Post Ratings: 4.5/5 stars - 8 votes in total. Thanks for commenting, Jonathan. Tested the feature to recover messages from iTunes using PhoneRescue, and it worked well. But it seems hard to access my message conversations in iCloud. Obviously, It would be better if it could. There seems no big difference between Enigma and Dr.Fone or PhoneRescue on recovery ability. And the differences are price, money back policy. If the trial wouldn’t get back scan sth you lost or deleted, you are suggested not buy it. Surely, you can buy to have a try on its full version since there is money back guarantee. Hi Richard, some of the apps you covered don’t work to retrieve data from my iOS mobile device directly. You may need a deep testing on the app enigma and dr.fone. BTW, thank you for your comment and good advice on my site. Dave, thanks for your visit back and give me feedback on this post. The fact is that for all data recovery apps, it’s hard to recover all deleted data from device since the difficulty of analyzing iOS storage and database. Besides, data overwriting will make the analysis more difficult. What we expect is finding one app that has a greater ability to recover data from iOS system. It would be better if the app could be easy to use and cheap to buy. Richard, thanks for inviting me to comment here. And it’s a nice post, and some apps did good to get something from my device, but after the scan, I didn’t find those I really want. What i care about is the ability to restore my lost data, it’s a terrible hit for me of losing hundreds pictures from my iPhone. If there is one data recovery software getting them back, it could be my best.